Dr. Kendall L. Baker, D.D. Dr. Kendall L. Baker is a native of Houston, TX who was raised in Fontaine Place; a northeastern Houston suburb. He attended several local colleges, Bible colleges and seminaries and currently holds a Doctorate of Divinity degrees from Kingdom Builders Bible Seminary. He is married to Lady Esther Iyoha Baker. They recently celebrated their third wedding anniversary on February 26, 2014. In 1994, Dr. Baker accepted his ministerial calling while ministering alongside his biological father, Pastor Earnest L. Baker of Wilson Temple Church of God in Christ in Rosenberg, TX. 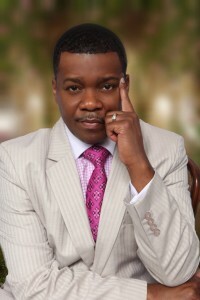 Nineteen years later, in 2013, Dr. Baker founded Christ Solid International Church; a trans-denominational, apostolic church located on Houston’s southwest side. The ministry offers weekly worship services, evangelism, teaching and prayer to the community. As Senior Pastor of Christ Solid International Church, Dr. Baker operates under the apostolic anointing of prayer, prophecy, healing and deliverance, where the Living Word from the throne of heaven is ministered with power to the people of God. His Sunday services from the inception of the ministry started in his town home with only a few believers who believed in the purpose, vision and the call upon the life of the man of God. As the Lord added to the ministry daily, they have since moved into the Cedar Creek club house and have future plans to relocate to a larger sanctuary. In addition to traveling annually around the country and to South Africa for ministry opportunities with Bishop T. D. Jakes Ministries, Dr. Baker has been used by God to preach the gospel in many countries including, Nigeria, Ghana and the United Kingdom. Dr. Baker also attends crusades and works closely with Pastor Benny Hinn. In 2006, he was ordained under the Potter’s House International Pastoral Alliance (P.H.I.P.A.) – a spiritual covering for senior pastors, under the leadership of Bishop T. D. Jakes. In 2007 Dr. Baker contested for a Houston City Council At-Large seat that was later won in a run-off by Melissa Noriega. In March of 2011, Dr. Baker was elected to the office of the 3rd Vice President/3rd Bishop and Overseer of the Family Life International Fellowship, Houston jurisdiction under the leadership of the late Bishop Robert C. Jefferson. Dr. Baker is also the founder of Straight Up Ministries, Inc., a non-profit 501(c)3 geared towards ministry, caring for the needy, sheltering the homeless, employment consultant, motivational speaking and mentoring and empowerment of youth. Dr. Baker retired from the City of Houston after 29 years of public service. His exiting position was a Division Manager for the Administration and Regulatory Affairs Department, Operations Division, 311 Help and Information Center. There he served as a versatile professional with broad experience including management and staff development, in depth knowledge of contact center operations, and problem solving abilities. During his tenure, he also worked in various management capacities in other departments including the Office of the Mayor, Public Works & Engineering Department (PWE)- PWE – Consumer Affairs Division, PWE – Utility Operations Center and the then General Services Department – 911 Emergency Network. Apostle Baker was widely known as “the voice of the City” for the many illustrious voice-over jobs he performed for the City whenever called upon by the Houston Information Technology Services or (HITS} Department. While working for the City of Houston, Dr. Baker simultaneously pursued the call to ministry. From 2012 to 2014, Dr. Baker served as the inaugural Chairman of the Houston Police and Clergy Alliance as well as a past member of the Houston Ministers Against Crime, where he served for nearly 20 years. In the past, Dr. Baker has also served with the Houston Independent School District south area, the Harris County Juvenile Operating Board and the NAACP Houston Branch. He is currently a volunteer executive assistant and soon to be Executive Director of the Houston Area Pastor Council (HAPC), under the leadership of Rev. Dave Welch. HAPC was founded in 2003 by Rev. Welch working alongside a group of thirteen pastors as a trans-denominational, inter-racial coalition of senior pastors who came together to bring a united, Biblical voice to the city, state and nation. We have since grown to over 300 plus senior pastors in the Houston area as well as assisted in developing Pastor Councils in Austin, Beaumont, Sacramento, Virginia Beach, San Antonio, El Paso and other cities around the nation that are organizing, subsequently birthing the identity of the U. S. Pastor Council (USPC) and Texas Pastor Council (TXPC) to connect those teams of pastors. USPC is the only culturally and politically active organization from a Biblically grounded perspective that is focused on developing strong, functioning teams of pastors in each city as a means to enlisting a strong remnant at the grassroots level.